It took me a while to find a title for this one. I remembered the belgariad books by david eddings and searched my mind for a place that would fit for my painting. I studied the maps that are in the books and found the ‘arend’. 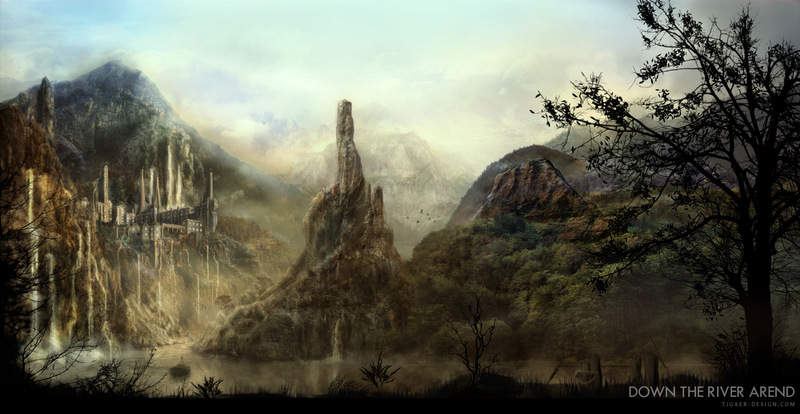 The arend divides the lands of arendia and tolnedra. The arend flows through woody areas, which really fits to my painting, and ends in the lands where once was the mighty/legendary battle of vo mimbre. Where the people of the west fought and won against the large army lead by the evil god torak. The evil god got wounded and did fell into a sleep… until the child of light comes to challenge him. To decide all things that are and will be… for ever. This entry was posted on Thursday, January 11th, 2007 at 16:42	and is filed under Artworks & Archive. You can follow any responses to this entry through the RSS 2.0 feed. You can leave a response, or trackback from your own site.